With Bing Ads Editor, you can associate specific remarketing lists to your ad groups making it easier to deliver the right ad to the right customer. And now, you can further refine your ad audience with the newly introduced negative remarketing lists that allows you to exclude specific audiences and thereby achieve higher ROI. Remarketing exclusions allow you to focus on the people who matter most to your business by excluding the ones who may not fit within the objectives of your ad campaign. For example, if you sell TVs online and want to reach out to new prospects, you may want to exclude existing customers from your ad campaign. Or, let’s say you want to focus on people who are in a specific stage within the purchasing funnel. You have a customer who added items to their cart but hasn’t made a purchase yet. In this instance, you could use a combination of targeting associations and exclusions to precisely reach the customer you’re trying to reach. You can now create, modify, and delete negative remarketing associations from Bing Ads Editor. One or more remarketing lists can be associated as negatives for one or more ad groups. Learn more. 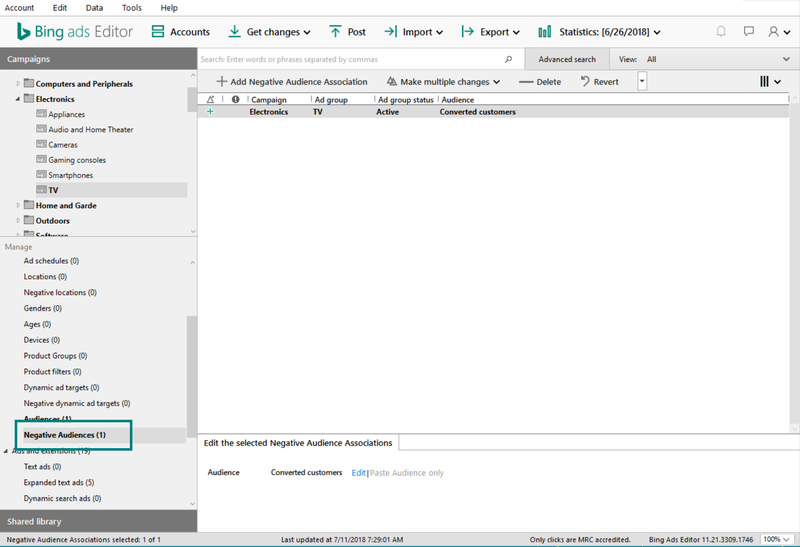 Note: With Bing Ads Editor, you can associate negative remarketing lists with your ad groups but cannot create, modify, or delete remarketing lists. You will need to go to Bing Ads online to manage remarketing lists.